The House of Representatives has passed a resolution to withdraw U.S. military support for the Saudi and Emirati-led coalition in Yemen, a historic vote that sends a strong rebuke to President Donald Trump's foreign policy one month after Democrats took control of the chamber. The vote in the House Wednesday was 248 to 177, with 18 Republicans joining Democrats to pass the resolution. A Senate vote is expected in the coming weeks. Similar legislation passed the Senate last November and is expected to succeed again, congressional aides told ABC News, setting up a showdown with the White House. A severely malnourished boy rests on a hospital bed at the Aslam Health Center, Hajjah, Yemen, Oct. 1, 2018. An estimated 85,000 children under age 5 may have died of hunger and disease since the outbreak of the civil war. If it makes it to the president's desk, it would be a historic moment in U.S. history -- the first time Congress, which has constitutional power to declare war, has used the War Powers Act of 1973 to pull back American forces from a conflict where the commander-in-chief has deployed them. "It's a paradigmatic shift of Congress reasserting our role," said Rep. Ro Khanna, D-Calif., who authored the bill and has introduced it in two prior years. "We are going to reclaim the power on matters of foreign intervention." "The reason why Paul Ryan fought tooth and nail against this, why some Republicans are so scared of this resolution is that any member can have confidence now to introduce a resolution like this. Any member of Congress can do this and force Congress to take votes on future military interventions ... It should make presidents think twice before deploying our troops or resources," he told ABC News. The White House lobbied hard in late 2018 to persuade lawmakers to kill the resolution, succeeding in the then-Republican controlled House, but failing in the Senate after Republicans were upset about how the administration has handled the murder of Washington Post columnist Jamal Khashoggi by Saudi officials inside the consulate in Istanbul, Turkey. Secretary of State Mike Pompeo speaks to members of the media following a closed briefing for US senators on Saudi Arabia in Washington, DC, Nov. 28, 2018. "The premise of the joint resolution is flawed," a White House statement said Tuesday, adding that Trump's senior advisers would recommend he veto the resolution. In particular, they argued the U.S. military role is "limited" to defense cooperation and "has not caused United States forces to be introduced into hostilities." Beginning under the Obama administration, the U.S. has provided military support for Saudi Arabia, the United Arab Emirates and their coalition backing the internationally recognized government of Yemen. That assistance included midair refuels for its warplanes, training and advising for troops and on aerial targets, selling weapons and ammunition, and sharing intelligence. While the Pentagon announced the midair refuels had concluded in November 2018, the other activities have continued. 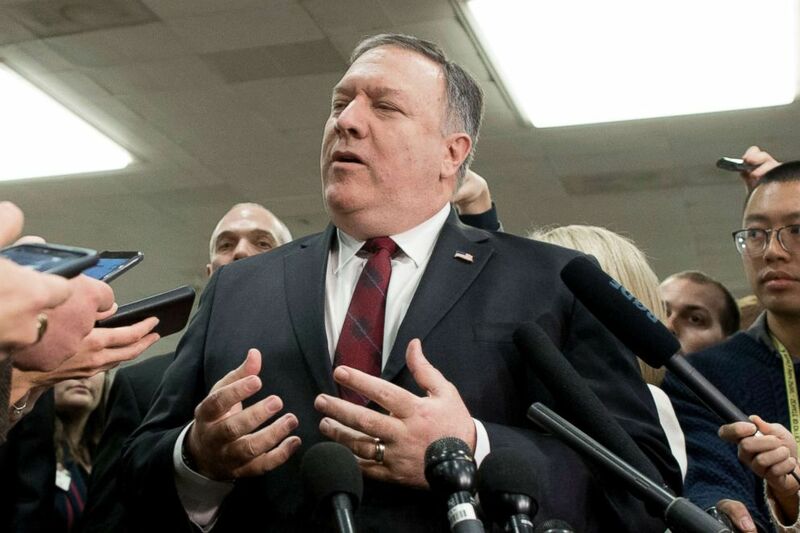 Secretary of State Mike Pompeo was the first Trump official to respond to the vote, telling PBS: "Members of Congress, I was one, they get to vote the way they want to vote and pass resolutions they want to pass, that’s certainly their right... We certainly hear their voice with respect to Yemen." While it doesn't appear that Congress has enough votes to override a presidential veto, Khanna said with the political dynamics changing, it is possible: "At the rate we've been building, who knows?" 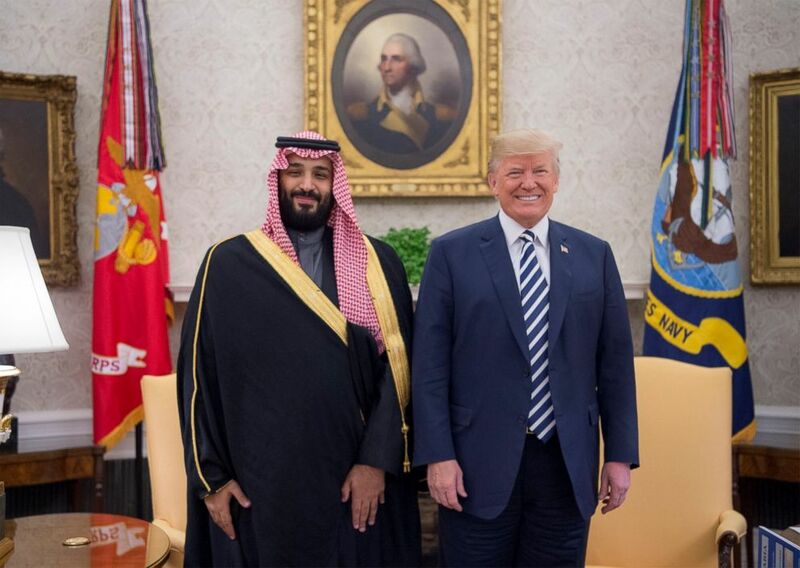 President Donald Trump poses for a photo with Crown Prince Mohammed bin Salman Al Saud of Saudi Arabia in the Oval Office at the White House on March 20, 2018 in Washington. Opposition to U.S. involvement in Yemen has brewed for years. But outrage over Khashoggi's murder and Trump's defense of Saudi Arabia and its young crown prince, Mohammed bin Salman, has galvanized support for the Yemen resolution in recent months -- a fitting tribute, according to Khanna, as Khashoggi was critical in his columns of the crown prince and Saudi military intervention. The administration has fueled that outrage in the last week by refusing to meet a Congressional deadline to investigate what role Prince Mohammed, sometimes known by his initials "MBS," played in Khashoggi's killing. Republicans have joined Democrats in demanding a response, but in the face of stonewalling, many have turned to support the War Powers resolution, too. According to Khanna, however, more likely than a veto override is that Republicans could urge Trump to support the resolution or come into compliance with the resolution, even without signing it. "I think we have a shot of persuading the president that he shouldn't be for another intervention," Khanna said in an interview, pointing to Trump's intention to withdraw from Syria and Afghanistan. To that end, Khanna will meet with Sen. Lindsey Graham, R-S.C., a close ally of Trump who's expressed fury over Khashoggi's killing, and spoke to Rep. Mark Meadows, R-N.C., chair of the Freedom Caucus and another Trump ally, Wednesday. 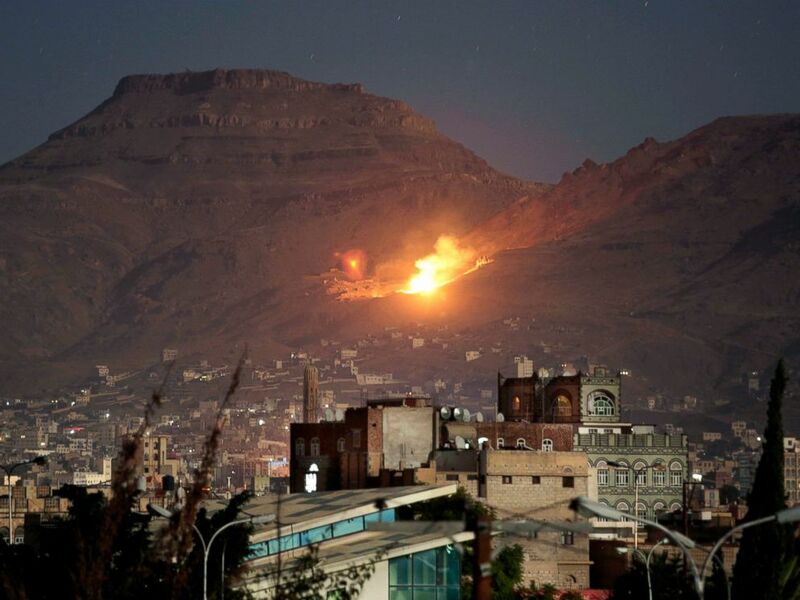 In this Oct. 14, 2016 file photo, fire and smoke rise after a Saudi-led airstrike hit a site believed to be one of the largest weapons depots on the outskirts of Yemen's capital, Sanaa. 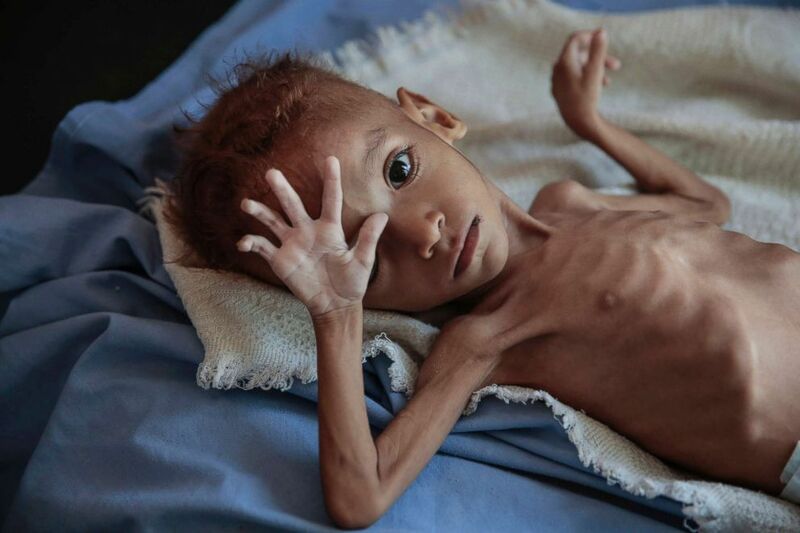 Yemen, which is larger than the size of California and home to more than 28 million people on the southwestern corner of the Arabian Peninsula, is on the brink of a massive famine, the scale of which the world has not seen in decades, according to the United Nations. The Yemeni economy has collapsed, leading to sky-high prices, no income for the majority of Yemenis and few able to afford food or other basic necessities. While the warring sides siege cities or blockade ports, the world aid delivered to the country rarely finds its way to those in need. Amid the starvation and violence, health care facilities have also been destroyed. The country has been wracked by civil strife since 2011, which exploded into a civil war in 2015. Saudi Arabia and the United Arab Emirates joined the conflict in support of the internationally recognized government of Yemen against Houthi rebels, turning the conflict into a proxy war with the Saudis' regional foe, Iran. Both sides in the nearly four-year-old war have been accused of war crimes, but with their more sophisticated militaries, the Saudi-led coalition has been accused of indiscriminately bombing civilians and even targeting civilian infrastructure to exacerbate the humanitarian toll -- leading to that bipartisan chorus in Congress calling on the U.S. to halt its support.